The 5-Year Multi-Year-Guaranteed Annuity (MYGA) is the most popular annuity type that we represent, and it can be difficult to get a quick snapshot of what each company is currently offering. 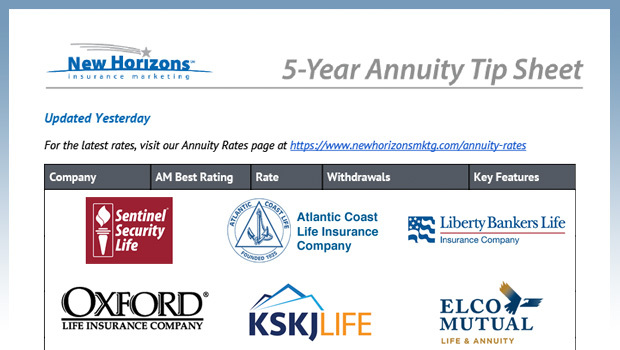 At any time, you can view annuity rates for all of our annuity products here. You can also read our Quarterly Annuity Update featuring Kirk Sarff, where you’ll be able to see which annuities other agents are selling the most right now along with industry updates and announcements. …so we have developed a 5-Year Annuity Tip Sheet that is updated regularly. You can download the most recent Tip Sheet here.